Beginning in spring 2004 and continuing through summer of 2005, Jordan Weeks, a UWSP graduate student will study movement of walleye and muskellunge in the Manitowish Chain. This study hopes to determine: (1) if walleye and muskellunge spawn in the same lake within the chain each year; and (2) if walleye and muskellunge use multiple lakes in the chain for spawning and feeding. Weeks, along with Department of Natural Resources fisheries survey crews will mark all walleye and muskellunge captured on spring spawning grounds with uniquely colored and numbered T-bar anchor tags (commonly called loy tags). A sub-sample of each species will also be fit with radio transmitters. Using these two marking techniques, Weeks hopes to quantify fish movement and spawning site fidelity. 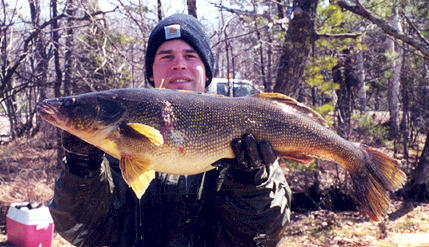 Information collected during this study will help DNR fisheries managers better manage lake chains throughout the state. RELEASED fish: Please leave tag securely attached to fish! Write down tag number, color, lake where fish was caught, date, and approximate time of capture. Forms are available at local tackle shops (or a piece of paper will do) and at the Manitowish Waters Chamber of Commerce. HARVESTED fish: Please indicate tag color and number, lake where the fish was caught, date, and approximate time of capture. Forms are available at local tackle shops (please attach tag to information) and at the Manitowish Waters Chamber of Commerce. Thank you for providing information on your tagged fish!